Despite its modest product portfolio, OnePlus is still persistently making headlines, mostly due to an ingenious mix of viral marketing and intriguing products that tend to fuel fan interest. The OnePlus 2 has been around for a few months now and so understandably the OEM is working hard and already preparing for its next "flagship killer" offer. We haven't seen or heard a lot about the OnePlus 3yet, apart from a couple of low-res renders, so a newly unearthed product clip is definitely an interesting find. 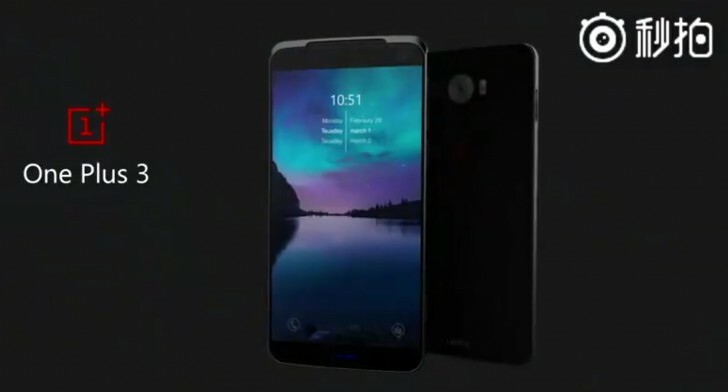 The short video offers a glimpse at the design of the upcoming handset, or at least a render of it and offers a few bits of extra information. From the looks of it, the OnePlus 3 will be a truly gorgeous device, with a slick metal frame - a bit curvier than the one on its predecessors. Interestingly enough, the signature sandstone back, that made both the OnePlus One and OnePlus 2 instantly recognizable, seems to be replaced with a brushed metal back. However, it might still be an option for the OnePlus 3 and part of the manufacturer's experimentation with different materials, like the ceramic on the OnePlus X. The video also suggests a dual-tone LED flash on the back and possibly another one on the front. The USB port seems to be Type-C, which was to be expected and although is is hard to tell, there might actually be stereo speakers on the front of the unit, just like a previous rumor suggested. Other alleged specs on the OnePlus 3 include a 5.5-inch 1080p display (with QHD also a possibility). The handset should be powered by a Qualcomm Snapdragon 820 SoC and have two memory options - 4GB of RAM pus 16GB of storage or a whopping 5GB of RAM and 64GB of storage (although the latter RAM capacity seems too odd of a number and won't likely come to pass). An upgrade to battery capacity is expected as well, possibly to 3,500 mAh. And the camera setup should consist of a 13MP main shooter and a 5MP selfie one. According to industry sources, the OnePlus 3 could be launched in the summer of 2016. Thats a fan made video, its just for practice not official at all.